From Almhult, Vaxjo lies about 60 kilometers northwest and happens to be the closest decent sized town and where we tend to go when needing a bit of “city life”. Today was a dreary day, so the prospect of entertaining our two young boys inside or around the gloomy playground here in Almhult did not appeal. A nice car ride plus a few local attractions was a much better way to spend the day. There are many things to do with kids in Vaxjo. During our first weekend in Sweden, we came up here and stumbled upon a really nice street carnival in the old downtown area near the train station. Even without a carnival, every Saturday there is a farmer’s market in this area and decent boutiques for those that enjoy shopping, and have kids that allow them to do so. On a typical escape to Vaxjo, we would visit Leo’s Lekland, a large indoor kids play place and a stop at MAX Burger, Sweden’s answer to any and all more inferior fast food burger joints. However, today we decided to look into two local attractions that had eluded us thus far: the Teleborg Castle and the Teleborg Water Tower (aka Echo Tower). Teleborg is a small community just off of Vaxjo that is home to Linneaus University. While we did not have exact directions to either of these attractions, we were able to locate both quite easily. Our first stop was at the Teleborg Castle, which is not really a castle…but yet it is. Completed in 1900, the castle was a wedding gift from Count Fredrik Bonde of Bjorno to his young bride, Anna Koskull; and though the marriage did not last long (the Count died eight years later) the gift is still quite beautiful. The castle is currently a high-end hotel and conference spot, but is open to the public on Sunday afternoons for tea and coffee. But bring a picnic lunch and enjoy the beautiful castle grounds. 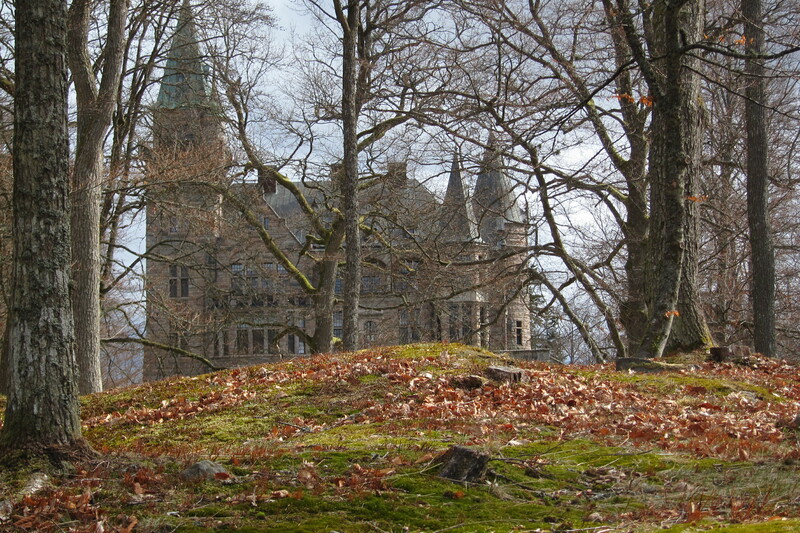 The castle is situated on a wooded hill overlooking Lake Trummen and the surrounding grounds has a scattering of benches, a few picnic tables, and plenty of open grassy fields closer to the university. And don’t forget your discs!! A disc golf course starts right at the parking lot and goes out through the woods encircling the castle. (Not realizing this, I did not have my discs so cannot testify to the quality of the course.) The castle also marks a great spot to venture out either on foot or bike on the trails that circle the surrounding nature reserve and that connects to the numerous trails that go all around Vaxjo too. 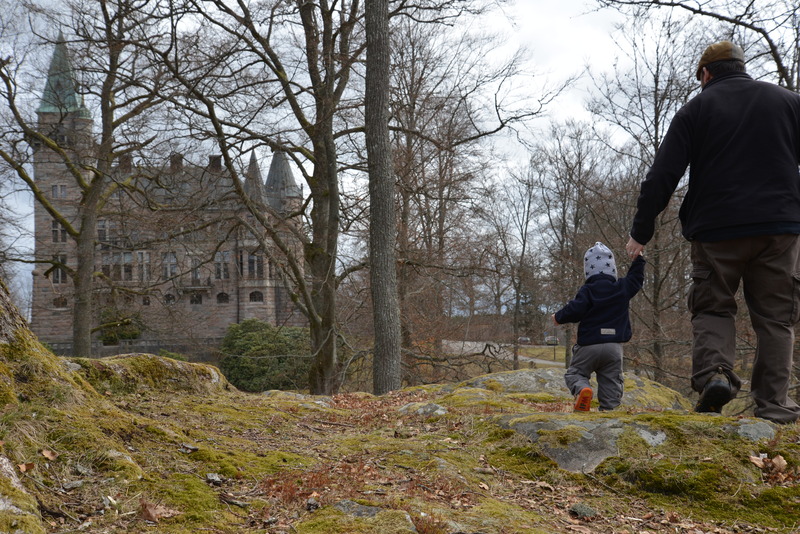 For us, it was a nice short walk around the grounds to admire the castle, where K played at being a knight and M got a chance to challenge his new mobility. After about 45 minutes, we were off in search of the Teleborg Water Tower, which we luckily could see in the distance from the elevated location of the castle. 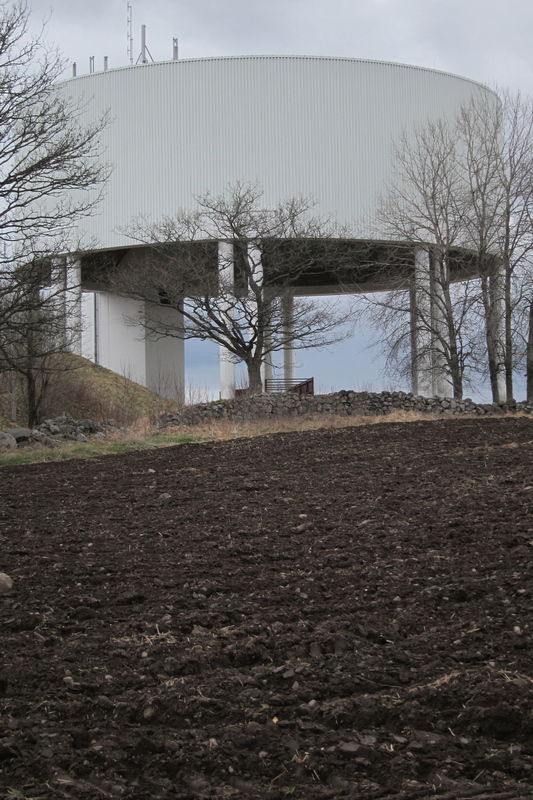 After the completion of the water tower, it was discovered that the unique design of the utility building happened to make a near perfect echo chamber, which is said to be a complete accident. Arriving to an empty parking lot, there was some skepticism in the air and K definitely wanted to go get food and not look at a drab white water tower on the edge of a muddy field. But, we got him out and went up to the tower to see what it was all about. We spent the next 15 minutes is a bit of echo stupor, complete with silly grins and the oddest sounds we could make, which would amazingly reverberate seemingly forever. Even the smallest of sounds were picked up, amplified, and bounced back to us over and over again. K had a riot, and the rest of us were not too far behind. The experience even had me feeling like a little kid and wishing that I had more things to make noise with. We even discovered another surprise of the water tower as we were leaving. We had exited out from underneath the cavernous ceiling, but K dashed back in to get one more good shout out…at it was completely silent, at least to us. It seems that from the outside of the tower, all of the sound is completely absorbed from within. I know how magically the tower would take up even the smallest sound and send it crashing back down on us when we were underneath the dome…but when K ran in to scream again…only silence met my ears. A very cool 15 minute stop. With the echo tower checked off our list, it was off to get a bit of city food, which with kids means some quality fast food. Subway for me and MAX Burger for the rest. We took the food to go because by this time, both M and K were fast asleep in their car seats. So, S and I enjoyed a very leisurely car ride home through the beautiful Swedish countryside, which I can just not get enough of.